Heat oven to 200°. Generously butter large cookie sheet; keep warm in oven. Mix brown sugar and maple syrup in 8-cup microwavable measure. Microwave uncovered on High 5 minutes. Stir in nuts. Microwave uncovered on High 5 to 7 minutes or until syrup is bubbling and nuts are toasted--syrup will be very hot. Stir in butter. Microwave uncovered 1 minute. Quickly and thoroughly stir in baking soda until mixture is light and foamy. Pour onto cookie sheet; quickly spread candy. Cool 30 to 60 minutes or until hardened. Break into pieces. Store candy in airtight container at room temperature up to 2 weeks. If you're not fond of mixed nuts, feel free to use an equal amount of your favorite nut. Out of maple syrup? Use corn syrup instead. 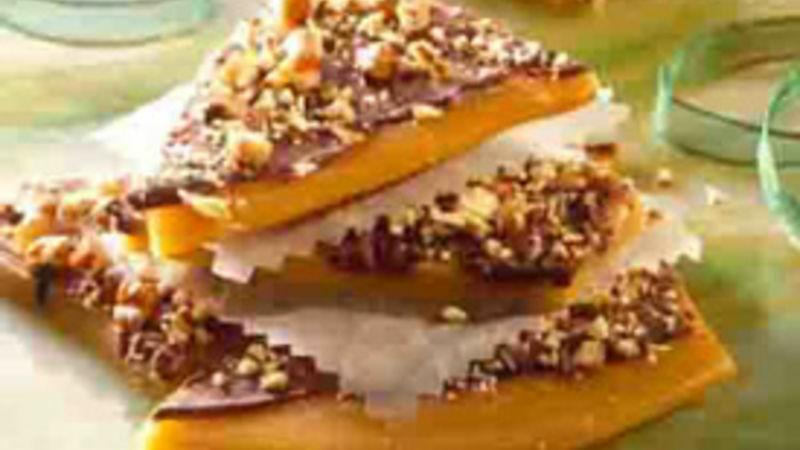 For a festive touch, drizzle melted semisweet chocolate or white baking chips in a zigzag pattern over nut brittle.